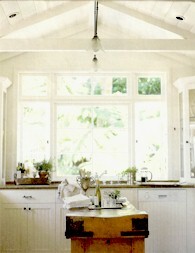 I've always loved the look of open ceilings – it gives a room such a bright, spacious and open feeling. In the room above I have an open beam ceiling that adds a lot of character to the space. Of course my open ceiling (and room) is painted white. This room isn't as high as some cathedral ceilings, but still has a similar look and feeling. If you're renovating or building and have an option to create a room with an open ceiling, it can definitely add a lot of style to your home. I've always liked the look of an open cathedral ceiling, and many of the rooms below have beams and exposed boards painted white. Here are a few of my favourites in my inspiration file!